Apples are coming in at our local orchard, which signals the commencement of apple recipe season for me! I dearly love all of the wonderful flavors of this season and like to take full advantage of fresh local apples whenever possible. Today’s recipe is a showstopper – another one my mother can’t stop raving about. Y’all know if you’re cooking something and your Mama likes it, you’ve done good! 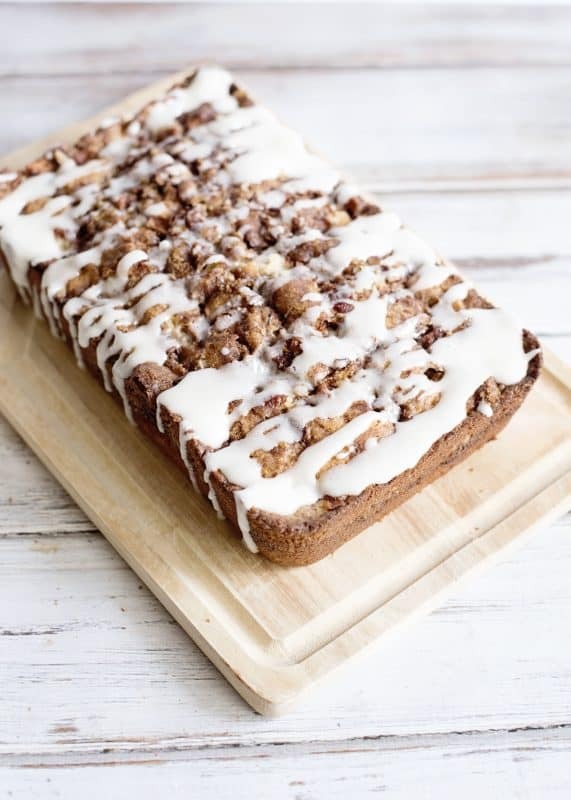 To make this, you’ll need: Brown sugar (light or dark, whatever you have is fine), cinnamon, white sugar, butter, eggs, milk, self rising flour, vanilla, apples, powdered sugar, and walnuts or pecans (nuts are completely optional though). This seems like a lot of ingredients but it’s pretty standard pantry stuff so you likely have all you need already. 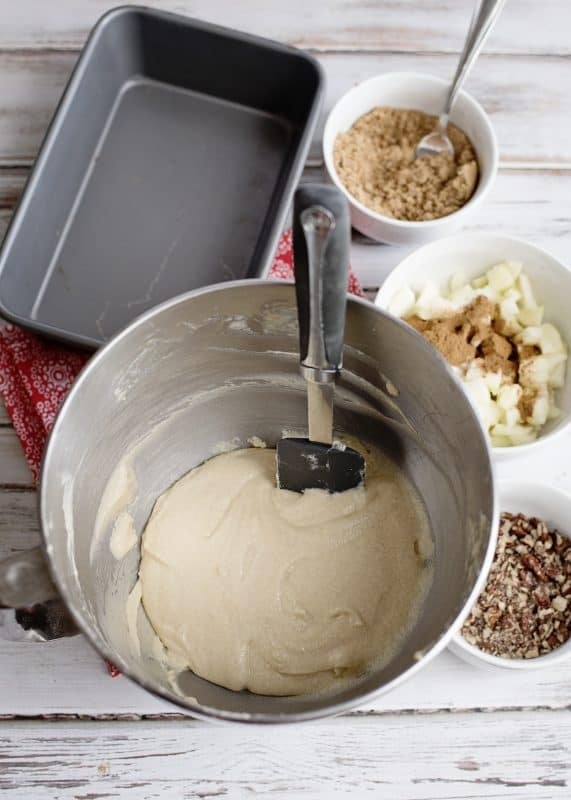 Begin by making your cinnamon topping by stirring together the brown sugar and 1 teaspoon of cinnamon. Set this aside. Go ahead and peel and dice your apples as well. 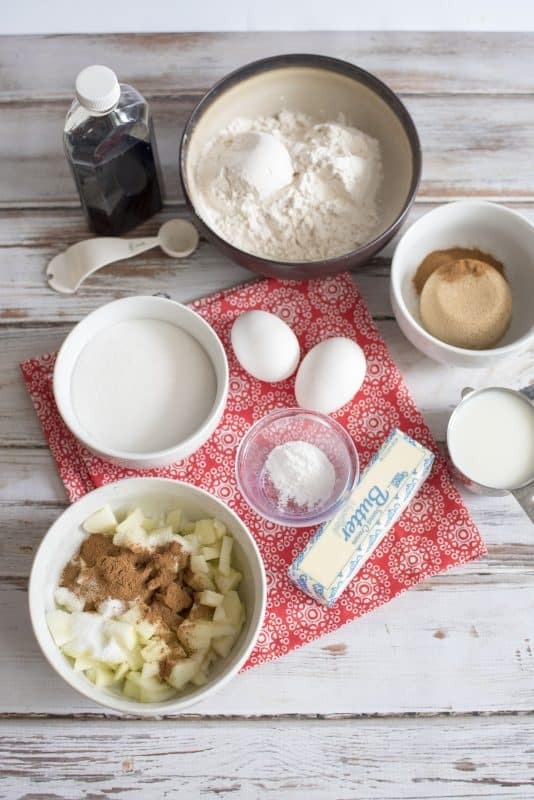 Place them in a bowl with granulated sugar, cinnamon and stir that together. Set this aside also. (exactly measurements for topping and filling are in the printable recipe card at the bottom of this post). In a large mixing bowl, with an electric mixer, beat together room temp butter and granulated sugar until fluffy. Add in eggs, milk, vanilla, and flour and beat until well incorporated and smooth, scraping sides as needed. 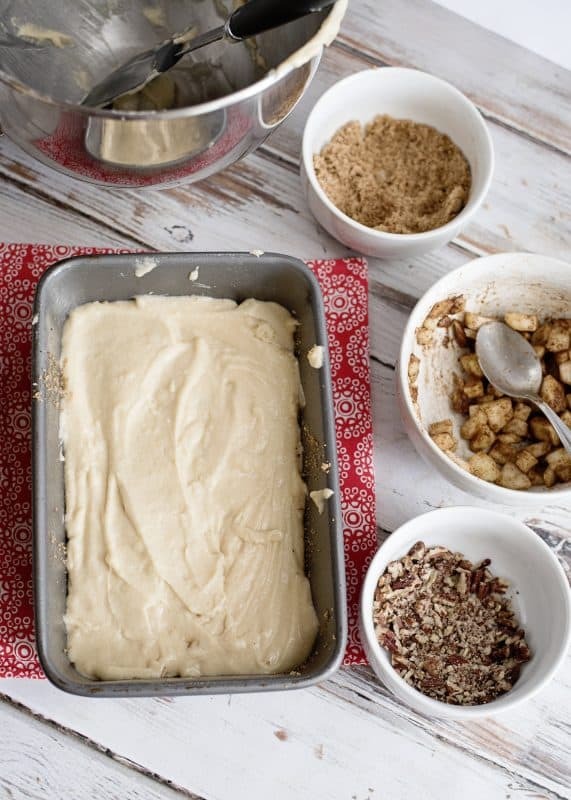 Pour half of this batter into greased 9×5 loaf pan. 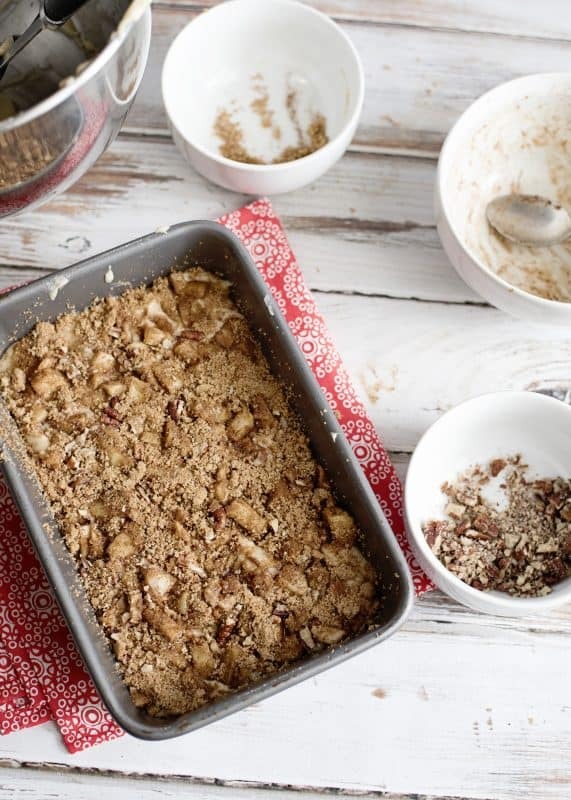 Sprinkle batter with half of the apple mixture, half the chopped nuts, and half of the cinnamon sugar mixture. Top that with the remaining apple filling mixture and the remaining cinnamon sugar mixture. Bake this at 350 degrees for 55-60 minutes, or until a toothpick inserted in the center comes out clean. Allow to cool in the pan for ten minutes before turning out onto a platter and then allow to cool completely. Once cooled mix together glaze ingredients until smooth and use a spoon to drizzle generously over the top. Get ready to impress folks! Perfect for a sweet breakfast, afternoon pick me up, or evening coffee and conversation. I hope you get to make this soon. Be sure and print out the recipe at the bottom to add to your files! Preheat oven to 350 degrees. 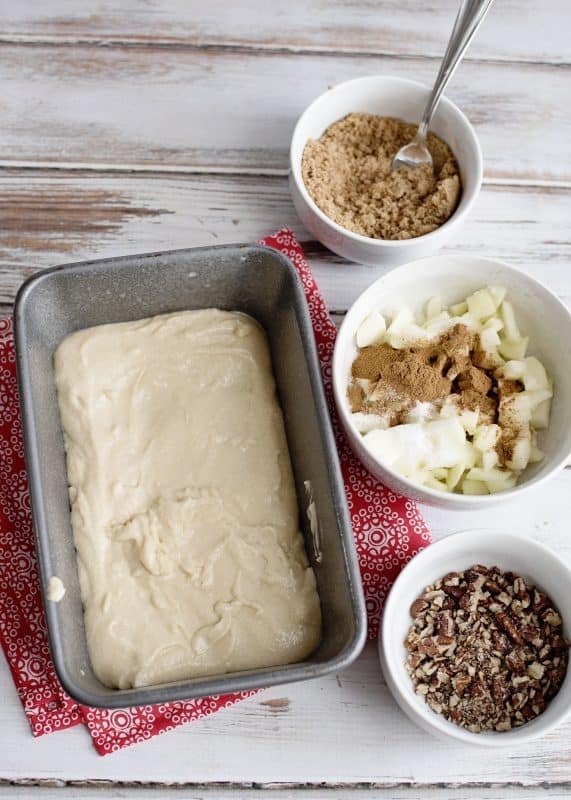 Prepare 9 X 5 loaf pan by spraying with non-stick spray. Cinnamon Topping- In a small bowl, stir together the brown sugar and cinnamon. Set aside. Apple filling-Peel and finely dice apples into medium bowl. Sprinkle with the sugar and cinnamon and stir to coat. Set this aside along with the chopped nuts. Pour half of bread batter into loaf pan. 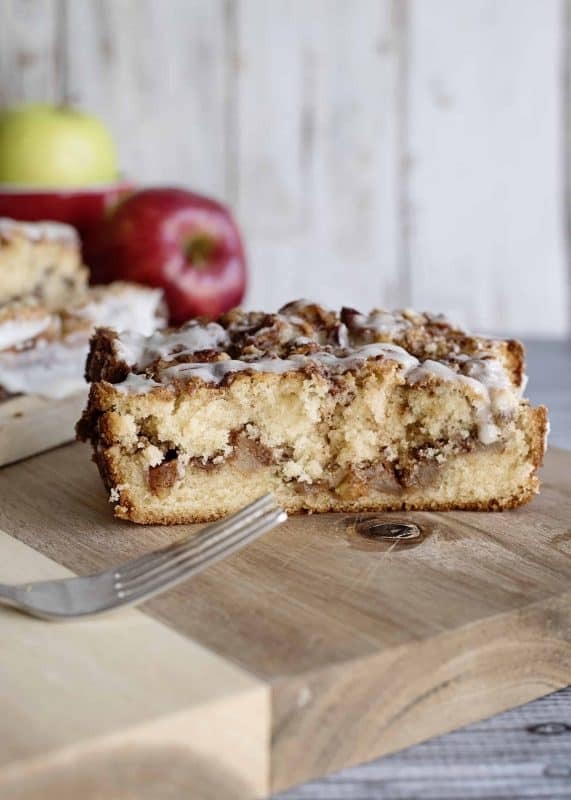 Top with 1/2 of the apple filling, 1/2 the nuts, and 1/2 of the cinnamon topping. Spread remaining bread batter over filling. 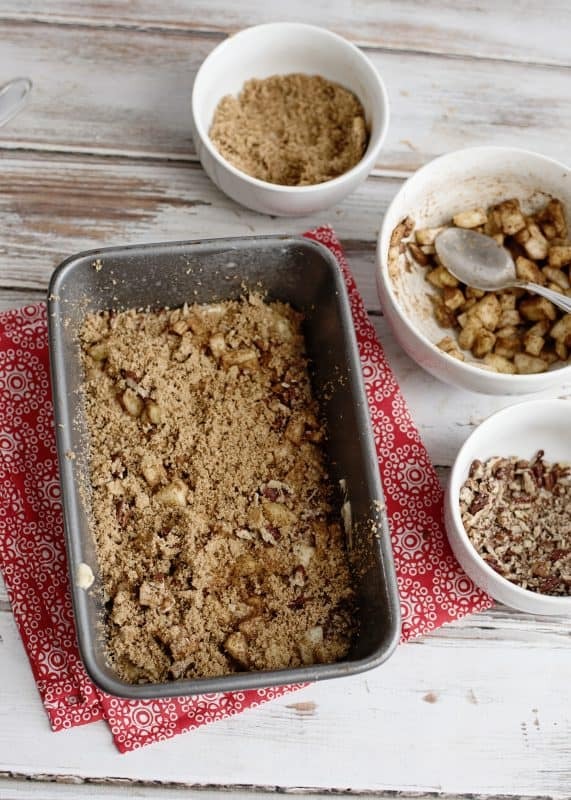 Top with remaining apple filling, nuts, and sprinkle remaining brown sugar cinnamon topping over loaf. Bake for 55-60 minutes or until tests done. Cool in pan for 10 minutes and turn out onto platter. Cool completely. Glaze: Mix together powdered sugar and milk until smooth. Use a spoon to drizzle glaze over cooled bread. If you really want to take this up a notch, add 1/2 teaspoon allspice to the cinnamon sugar mixture! 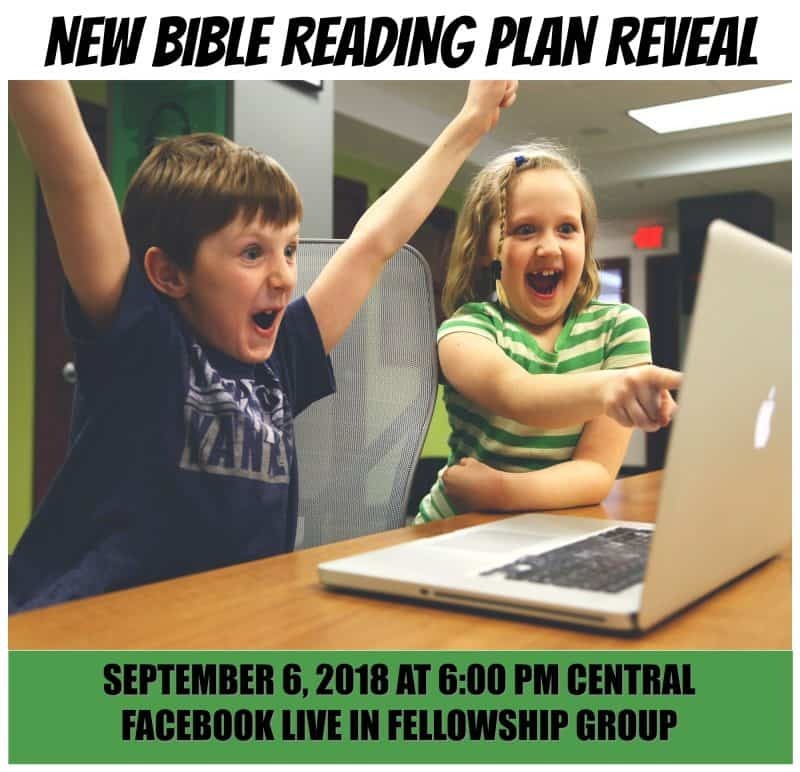 Also, if you’d like to join us as we read through the Bible together in one year over in my Christy Jordan’s Front Porch Fellowship Group on Facebook, I’m doing a live video tonight where I announce the new reading plan. We are finishing up our first year and the new plan begins October 2. We’d sure love to have you join us whether it be tonight or whenever you happen to see this. It’s a passion of mine to encourage folks to get into the Word, firsthand, on a daily basis. Click here to visit our group and request membership. Make sure you answer the two questions that you’ll be asked so I can add you. Thank you, Tess! You as well! Hoping to make the live feed tonight ~ but if not, I know I’ll enjoy reading it as much as I’ve enjoyed the daily readings this past year! And this bread??? Oh my goodness…..I’ll be trying to make this as well!!! Thank you!! Christy, this looks so yummy. I will be getting a bushel of apples on Monday. I can’t wait to make it. 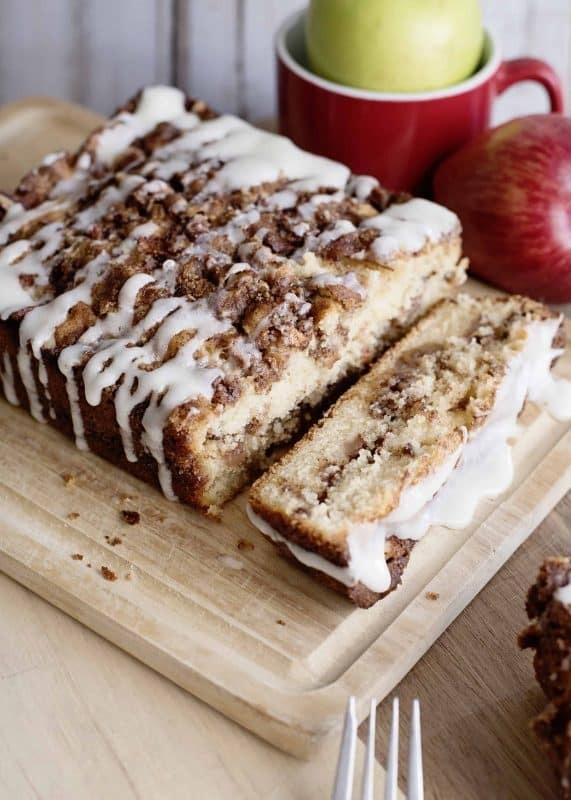 I also make the Apple Dapple cake. I made one for an auction and it was sold for $65.00!!! You know….it is that GOOD. Thanks for all the great recipes. Can’t wait to try this. Apple Hill just opened this week in the Placerville, CA area. Time for a visit. Thanks for sharing this recipe. I hope you have fun at Apple Hill and enjoy the bread!!! 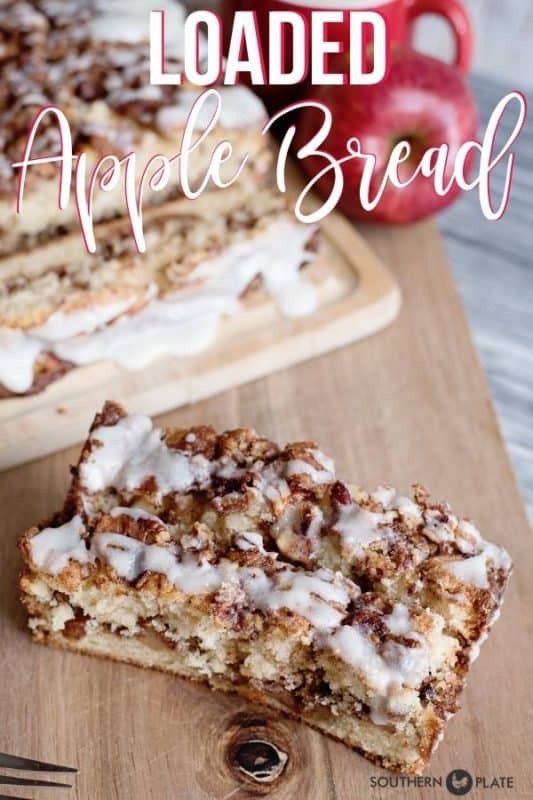 I’m going to need to try this after we go apple picking this fall. I can’t wait to hear how you like it!! Oh my, this looks good! I think I have all the ingredients, so I’ll be making this asap. Hi Christy. 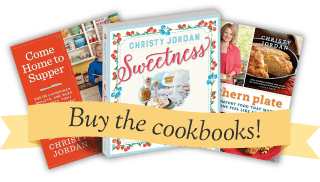 I really enjoy your site and all the yummy recipes! However, for some reason I can not print your loaded Apple bread and your Apple Dapple Cake. I’m anxious to try both! Can you give me an alternative to self-rising flour? I think the secret to this recipe is the way you separate the batter. Love everything about your site!!! To make your own self rising flour, simply add 1 1/2 tsp baking powder and 1/2 tsp salt for *each* cup of all purpose flour. 🙂 I hope you get to make it soon and thank you for being here! Looks so good. Will definitely try this. Thank you. I hope you get the chance to try it oon Laila, can’t wait to hear how you like it!! Thank YOU for being here Carol!! I took this to our Op Shop at church, they loved it! The only thing I did different was I added a little more glaze than you did. But everyone thought it was the bomb! I am so glad to hear everyone liked it Linda, you are such a blessing!! Why do you have to use self rising flour? Why not just add baking powder and salt to the flour as you’re mixing it? I use self rising flour so that’s what the recipe calls for. You are welcome to convert it to all purpose if that is what you prefer. I hope you enjoy it!